A Clinical trial of topical bleaching treatment with nanoscale tretinoin particles and hydroquinone for hyperpigmented skin lesions. Katsujiro Sato, Daisuke Matsumoto, Fumiko Iizuka, Emiko Aiba-Kojima, Chiaki Machino, Hirotaka Suga, Asami Watanabe-Ono, Keita Inoue,, Koichi Gonda, and Kotaro Yoshimura. The combination of topical tretinoin (all-trans retinoic acid; atRA) and hydroquinone is effective on various hyperpigmented skin disorders. Kligman and Willis1 introduced this treatment, and several modified protocols2 have been reported. In these therapeutic regimens, topical corticosteroids are used in combination with atRA and hydroquinone in order to reduce adverse effects such as irritation and erythema. We have previously proposed aggressive bleaching protocols,3-8 in which atRA and hydroquinone were used separately. Corticosteroids were not used, because corticosteroids reduce the melanin-discharging effect of atRA. Corticosteroids can lead to postinflammatory hyperpigmentation in bleaching therapy, especially in colored skin, probably by suppressing epidermal turnover and melanin discharge. Since 1995, we have successfully treated more than 15,000 cases of various skin lesions with epidermal hyperpigmentation using our bleaching protocols. In our combined bleaching treatment with atRA and hydroquinone, atRA discharges melanin granules from the epidermis by accelerating epidermal turnover,7,9 while hydroquinone strongly suppresses new melanin production.10 The hyperpigmented epidermis is replaced by less-pigmented epidermis in a few weeks. AtRA promotes the discharge of melanin granules in epidermis by (1) accelerating epidermal turnover (differentiation of keratinocytes) in a direct manner, and (2) promoting epidermal growth (proliferation of keratinocytes) in an indirect manner; the latter effect was found to be mediated by HB-EGF secreted by suprabasal keratinocytes.9,11 Thus, atRA has a specific effect as a discharger of epidermal melanin that cannot be performed by any other reagents or any peeling procedures such as alpha-hydroxyl acid peeling or microdermabrasion. These exfoliating procedures simply induce subsequent normal wound healing and only minimal acceleration of epidermal turnover. However, it is well known that atRA frequently induces irritant dermatitis, especially when used aggressively. As all-trans retinol (ROL) and all-trans retinal had been considered to be less irritating than atRA,12,13 we tried using 10% ROL aqueous gel instead of 0.1% atRA gel and achieved similar effectiveness, but failed to reduce the adverse effects.6 As yet, there is no way to reduce the irritant dermatitis without losing the bleaching efficacy of retinoids. Improved permeation and slow release of atRA from nanoscale particles may enhance its clinically beneficial effects and/or reduce its adverse effects, such as retinoid dermatitis. In this trial study, we prepared 0.1%, 0.2%, and 0.4% nano-atRA gels for clinical use in order to estimate the bleaching potential of nano-atRA gel and the extent of its adverse side effects. AtRA was commercially obtained from Wako Pure Chemical Industries Ltd. (Osaka, Japan), and 0.1, 0.2, and 0.4% nano-atRA gels were prepared using boundary-organized nanoscale reaction droplets as previously reported14 (Figure 1). The size and structure of the nano-atRA particles were confirmed by freeze fracture transmittance electron microscopy (ff-TEM, Hitachi Co. Ltd.). The nano-atRA gels were prepared at Institute of Medical Science, St. Marianna University School of Medicine. An ointment including 5% hydroquinone and 7% lactic acid (HQ-LA ointment) and an ointment including 5% hydroquinone and 7% ascorbic acid (HQ-AA ointment) were also prepared. Plastibase (petrolatum polyethylene ointment base; Taisho Pharmacology, Osaka, Japan) was used as the ointment base of the HQ-LA ointment, whereas a hydrophilic ointment (Taisho Pharmacology, Osaka, Japan) was used for the HQ-AA ointment. Each ointment was applied topically by 83 Japanese women and 1 man with facial hyperpigmented skin lesions, and the 77 patients (76 women and 1 man) who were followed up for more than 10 weeks were analyzed in this study. As 11 patients had two lesions, there were 88 hyperpigmented skin lesions in all, including solar lentigines (n = 10), melasma (n = 36), ephelides (n = 9), and post-inflammatory hyperpigmentation (PIH) (n = 33). Dermal melanosis and melanocytosis were not targeted. The other seven patients stopped the treatment because of their poor compliance. The age of the patients ranged from 16 to 84 years old (45.2 ? 15.4; mean ? SD). Our bleaching protocol consists of two phases, a bleaching phase and a healing phase.6-8 In the bleaching phase, discharge of epidermal melanin is accelerated by nano-atRA gel and melanin production is suppressed by HQ-LA ointment. In the healing phase, the discharge of epidermal melanin is discontinued and great care is taken not to induce new post-inflammatory hyperpigmentation, by using hydroquinone alone. In the bleaching phase, 0.1% nano-atRA gel and HQ-LA ointment were applied twice a day. Nano-atRA gel was carefully applied only to pigmented areas, using a small cotton-tip applicator, and subsequently HQ-LA ointment was widely applied with the fingers beyond the pigmented area (i.e., all over the face). Patients were asked to visit our hospital at 1, 2, 4, 8, and 12 weeks after starting this treatment. In most cases, it took 2 to 8 weeks to finish this phase. When scaling was not observed at 1 week, the concentration of tretinoin was increased to 0.2% or 0.4%. The concentration of tretinoin and frequency of its application were appropriately modified according to the skin condition and the degree of skin reaction. The healing phase was begun after pigmentation had improved sufficiently or 8 weeks had passed. The application of nano-atRA gel and HQ-LA ointment was discontinued, and application of HQ-AA ointment all over the face was started. HQ-AA ointment was used until the erythema was almost eliminated; it took 4 to 8 weeks to complete this phase. Topical corticosteroids were not employed in the bleaching or healing phase. In melasma patients, a second treatment was performed after a month’s interval if the patient requested it. Photographs of each patient were taken at baseline, during, and after treatment with a high-resolution digital camera (Nikon D70, Tokyo, Japan). The percentage of pigmentary clearance was evaluated via the photographs by two experienced plastic surgeons who did not perform this treatment. The mean data of the pigmentary clearance of each patient were classified into four categories: excellent (80% clearance or better), good (50% to less than 80% clearance), fair (0% to less than 50% clearance), and poor (no change or worse). The 88 hyperpigmented lesions were treated for an average period of 14.3 weeks. Almost all patients had sufficient improvement without serious adverse effects. Unpleasantness such as severe irritation and erythema during treatment seemed to be seen less frequently than in our thousands of cases treated with conventional atRA gel3-8. Mild erythema appeared in the first week in most cases and scaling was seen at the same time. Nano-atRA gel appeared to induce a lesser degree of erythema and a similar degree of scaling in the first 2 weeks compared to conventional atRA gel, although statistical analysis was not performed. Scaling was observed even in the initial stage of the healing phase, suggesting that the slow-release nano-atRA gel had long-term effects. Resistance to atRA, which always accompanies the conventional atRA treatment, was also seen with the nano-atRA treatment. The results of this study are summarized in Table 1. Forty-seven lesions (53.5%) were evaluated as ‘‘excellent’’, 22 (25.0%) as ‘‘good’’, 15 (17.0%) as ‘‘fair’’, and 4 (4.5%) as ‘‘poor’’. Most of the fair and poor cases had minimal skin reactions, such as scaling, during the bleaching phase. Representative cases are shown in Figures 2-4. Nano-atRA improved all four kinds of skin pigmentation disorders. Of 36 cases of melasma, 28 (79.3%) ranked “excellent” or “good”. The average treatment period of melasma patients was 14.1 weeks. Thirty-two of 33 PIH cases ranked “excellent” or “good”. There were no “poor” results in the PIH group. There were only nine cases of ephelides, more than half of which achieved “excellent” or “good” results. Only 4 of 88 lesions (two of melasma and two senile lentigines) showed “poor” treatment results. In our recent report, we used histology to confirm that accumulated melanin granules around the basal layer were cleared after treatment with atRA and hydroquinone. In acquired dermal melanocytosis, melanin deposits in the dermis appeared not to change.7 Thus, the bleaching therapy is only effective for epidermal pigmentation, and we therefore focused on various types of hyperpigmentation of the epidermis in this trial. Using nano-atRA gel based on the newly developed drug delivery system technology, we obtained results as good as those of previous studies that used our former atRA gel. The present treatment resulted in satisfactory improvement of melasma, with an average treatment period of 14.1 weeks. Roughly two-thirds of the melasma patients required only one session of the bleaching treatment, while treatment of melasma with our former atRA gel was sometimes performed in two or three sessions8. Of the various hyperpigmented lesions treated, PIH was most improved. This has always been true in our treatment of lesions with conventional atRA. The number of ephelides was small, but the majority of patients had “excellent” or “good” results. Among the four types of hyperpigmented lesions studied, the percentage of excellent and good results was lowest in the senile lentigines. Senile lentigines, especially those that are resident for a long period, frequently show excessive development of horny layers (hyperkeratosis) that may obstruct the penetration of atRA into the epidermis. This may also be the case with nano-atRA gel, though high permeation of nano-atRA was reported in murine skin.14 We recommend that irradiation by Q-switched ruby laser (or other lasers) for removal of hyperkeratinization of senile lentigines is first performed as done in Case 1 (Figure 2). In colored skin, PIH after laser treatments can frequently be a disfiguring problem. However, PIH after laser irradiation is always easily treated by the bleaching treatment described above. In our conventional bleaching treatment, there are two major problems: one is dermatitis induced by aggressive use of atRA, and the other is the biochemical instability of atRA in our ointments. We applied atRA only on the pigmented area but used it aggressively, which almost always led to irritant dermatitis on the area where it was applied. The dermatitis is the most serious side effect and remains to be resolved. In animal experiments, nano-atRA gel showed slower diffusion into the epidermis and higher degrees of epidermal alterations, as assessed by retinoid signals such as elevated HB-EGF mRNA expression, enhanced hyaluronic acid deposition, and epidermal hyperplasia, with a lesser degree of erythema.14 These advantages of nano-atRA appeared to be partly confirmed in this clinical trial, in which similar degrees of bleaching effectiveness and scaling were seen, with a lesser degree of erythema. In addition, the improved biochemical stability of nano-atRA to heat and light is another advantage,14 as we had to prepare the conventional atRA gel every month because of its pharmacological instability. The fact that nano-atRA gel can be stored for at least 6 months without significantly losing atRA chemical activity may increase its commercial profitability. AtRA has long been used for treating acne, photoaging-associated symptoms such as fine wrinkles, and hyperpigmentation. When used aggressively, atRA can be an extremely powerful tool for discharging epidermal melanin. Reducing retinoid-induced dermatitis remains a major challenge. New generations of synthetic retinoids or new drug delivery systems, such as the nano-atRA presented here, may resolve the problem. Nano-atRA gels used in this study were generous gifts from Dr. Yoko Yamaguchi and Dr. Rie Igarashi of Institute of Medical Science, St. Marianna University School of Medicine. Results of the Nano-atRA Treatment Protocol. Table 2. Clinical Results of Cases with Melasma. Figure 1. 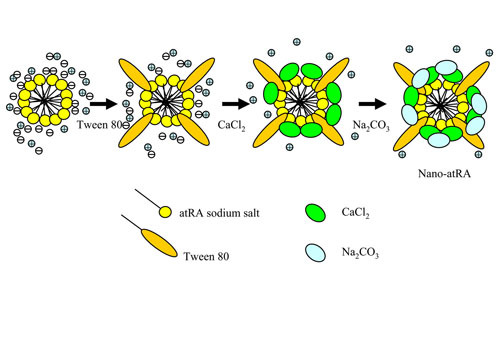 Schematic of the preparation of nano-atRA particles with their core/shell (CaCO3) structure. Figure 2. Case 1. A 40-year-old woman with a solar lentigine and melasma on her right cheek, first shown before treatment (A). The solar lentigine was first treated with a Q-switched ruby laser, but 4 weeks later PIH appeared at the original position (B). Bleaching treatment with 0.1% nano-atRA gel and HQ-LA ointment was performed for 4 weeks; the patient is shown at 2 weeks (C) and at 4 weeks (D). This was followed by healing treatment with HQ-AA ointment alone for 4 weeks. Only minimal erythema appeared during the bleaching phase. PIH was completely eliminated and the melasma was also apparently improved at 8 weeks (E). Figure 3. Case 2. 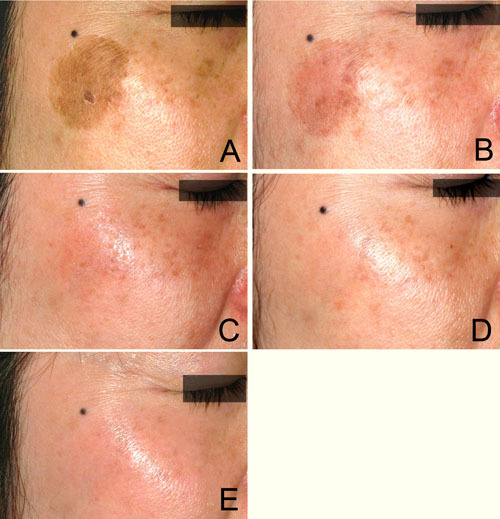 A 38-year-old woman with melasma on both cheeks is shown before the treatment (A). Bleaching with 0.1% nano-atRA gel and HQ-LA ointment was performed for 12 weeks, followed by application of HQ-AA ointment alone for 4 weeks. Mild erythema appeared during the bleaching phase, shown at 4 weeks (B). The melasma was almost cleared at 16 weeks (C). Figure 4. Case 3. A 53-year-old woman with a solar lentigine and melasma on her left cheek before the treatment (A). 0.1% nano-atRA gel was used together with HQ-LA ointment in bleaching phase for 12 weeks, and HQ-AA ointment was applied alone in the healing phase for 9 weeks. Mild erythema was seen during the bleaching phase, shown at 4 weeks (B). The melasma almost disappeared, while the solar lentigine became lighter, as seen at 21 weeks (C). 1) Kligman AM, Willis I. A new formula for depigmenting human skin. Arch Dermatol 1875; 111: 40-8. 2) Gano SE, Garcia RL. Topical tretinoin, hydroquinone, and betamethasone valerate in the therapy of melasma. Cutis 1979; 23: 239-41. 3) Yoshimura K, Harii K, Aoyama T, et al. A new bleaching protocol for hyperpigmented skin lesions with a high concentration of all-trans retinoic acid aqueous gel. Aesthetic Plast Surg 1999; 23: 285-91. 4) Yoshimura K, Harii K, Aoyama T, Iga T. Experience with a strong bleaching treatment for skin hyperpigmentation in Orientals. Plast Reconstr Surg 2000; 105: 1097-108. 5) Yoshimura K, Harii K, Masuda Y, et al. Usefulness of a narrow-band reflectance spectrophotometer in evaluating effects of depigmenting treatment. Aesthetic Plast Surg 2001; 25:129-33. 6) Yoshimura K, Momosawa A, Aiba E, et al. Clinical trial of bleaching treatment with 10% all-trans retinol gel. Dermatol Surg 2003; 29: 155-60. 7) Momosawa A, Yoshimura K, Uchida G, et al. Combined therapy using Q-switched ruby laser and bleaching treatment with tretinoin and hydroquinone for acquired dermal melanocytosis. Dermatol Surg 2003; 29: 1001-7. 8) Yoshimura K, Sato K, Aiba-Kojima E, et al. Repeated treatment protocols for Melasma and Acquired Dermal Melanocytosis. Dermatol Surg 2006; 32: 365-71. 9) Yoshimura K, Uchida G, Okazaki M, et al. Differential expression of heparin-binding EGF-like growth factor (HB-EGF) mRNA in normal human keratinocytes induced by a variety of natural and synthetic retinoids. Exp Dermatol 2003; 12(S2): 28-34. 10) Yoshimura K, Tsukamoto K, Okazaki M, et al. Effects of all-trans retinoic acid on melanogenesis in pigmented skin equivalents and monolayer culture of melanocytes. J Dermatol Sci. 2001; 27(S1): S68-75. 11) Xiao J H, Feng X, Di W, et al. Identification of heparin-binding EGF-like growth factor as a target in intercellular regulation of epidermal basal cell growth by suprabasal retinoic acid receptors. EMBO J 1999; 18:1539-48. 12) Kang S, Duell EA, Fisher GJ, et al. Application of retinol to human skin in vivo induces epidermal hyperplasia and cellular retinoid binding proteins characteristic of retinoic acid but without measurable retinoic acid levels or irritation. J Invest Dermatol 1995; 105: 549-56. 13) Fluhr JW, Vienne MP, Lauze C, et al. Tolerance profile of retinol, retinaldehyde and retinoic acid under maximized and long-term clinical conditions. Dermatology 1999; 199(S1): 57-60. 14) Yamaguchi Y, Nagasawa T, Nakamura N, et al. Successful treatment of photo-damaged skin of nano-scale atRA particles using a novel transdermal delivery. J Control Release 2005; 104: 29-40.